abusedbits.com: Enterprise WAN is evolving! 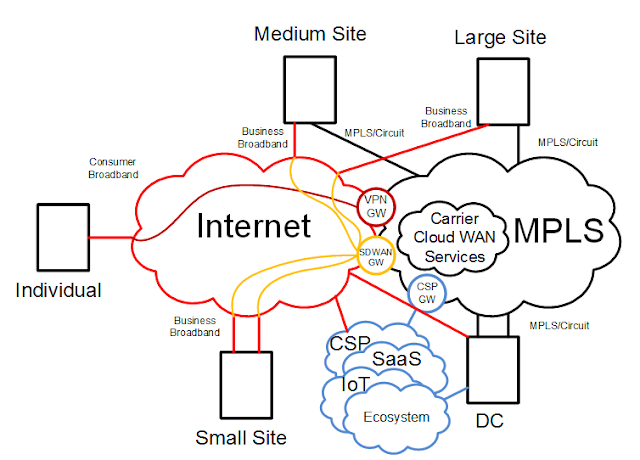 Figure 1 represents the high level Enterprise WAN Reference Architecture that current network capabilities seem to be indicating for the support of enterprise services. The MPLS network will be extended and enhanced utilizing gateway functions like VPN (which we currently do), CSP access that enables direct connectivity via the MPLS network and SD-WAN that will allow the extension of the MPLS via the Internet to small and medium size locations (maybe even large locations). SD-WAN will extend the capability of MPLS network to locations not natively available with individual carriers. It avoids the need to NNI carriers unless it is absolutely necessary. The carriage mechanism is tunneling over the internet and can support vendor/protocol specific optimizations for some quality of service (an abstraction of the underlying IP connectivity). Where SD-WAN cannot be on an MPLS gateway, the internet direct to DC will be able to support this functionality. This model also represents the dissection and reduction of networks that must be "carried twice", ingressing and egressing the Data Center perimeter security controls. These controls will eventually be migrated to the Carrier Cloud WAN Services. They will be provisioned for specificity in the enterprise application usage model or virtualized per application within the workload execution model. Traffic destined for CSPs and SaaS can use a more direct path via the Internet if allowed by the Enterprise. 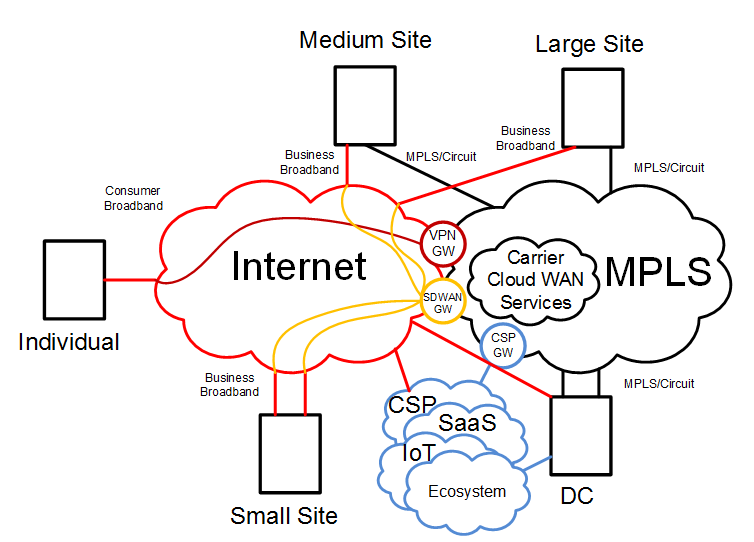 The CSPs, connected to the Internet, a CSP gateway to MPLS and Ecosystem networks connected directly to Data Centers will extend the Enterprise Network to support enhanced consumption of those types of services like SAS, IoT as well as the various Cloud Service Providers. Individuals will come in over a variety of connectivity mechanisms including broadband and telco wireless. Providing the cost structure is competitive, backup paths for many of these networks are likely to shift toward future implementations of Telco 5G.